Ki no Tsurayuki was a 9th century Japanese waka poet and royal courtier who lived at the time of the Heian period, a time of great religious influence on the country from Buddhism and Chinese Taoism. His most famous work was a collaboration with three other court poets on a waka anthology titled Kokin Wakashū, a major project ordered, and sponsored, by the Emperor Daigo. It is believed that he was born sometime during the year 872. He must have been well educated because he entered government service and rose to be the provincial governor in the two separate provinces of Tosa and Suō. Apart from this distinguished service though he was more famous for his poetry and diaries. He wrote one of the two prefaces of the above mentioned waka anthology and thus was able to set the standards for all waka poets that came later, all seeking to emulate his greatness. The other preface was written in Chinese. It was common at that time to display poems and illustrations on the folding screens that you would find in many households and other buildings. Poets before him had often written about heroic or historical events, whereas Tsurayuki was instrumental in the introduction of poems that were purely fictional. Another ground breaking achievement was to lay the foundations that would lead to the success of literature written by women later during the Heian period. This was possible because of his other great work, the Tosa Nikki (Tosa Diary). He wrote this diary in the persona, and from the point of view of, a woman, using the Japanese script known as kana. It was a kind of travelogue in effect, detailing a long and arduous trip from the Tosa province to Kyoto. 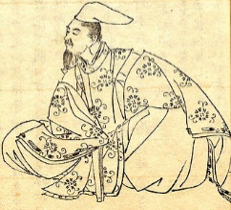 During the next century the legendary poet Fujiwara no Kintō declared that Tsurayuki was one of the “Thirty Six Poetry Immortals”, and a true waka master. These writers were considered to be “exemplars of Japanese poetic ability” but, some would argue, that Tsurayuki stood alone because of the critical nature of his waka preface in the Kokin Wakashū. He explored the mythological origins of the genre, comparing it to the modern version of that time, and was not afraid to criticise earlier poets such as Ariwara no Narihira. The legend of Tsurayuki lived on for many centuries after his death with his waka appearing in an important anthology of Japanese poetry called Hyakunin Isshu, a collection compiled by Fujiwara no Teika in the 12th century. He is also referred to in the Tale of Genji which was written by a noble woman named Murasaki Shikibu during the early part of the 11th century. The story describes his role as a waka master who, along with a group of female poets, has been ordered by the Emperor Uda to compose waka on upright panels. Ki no Tsurayuki died on the 30th June 945 at the age of 67.